Professor Richard McLaren speaks during a press conference following the publication of his report on drug use in Russian sport, in central London on December 9, 2016. 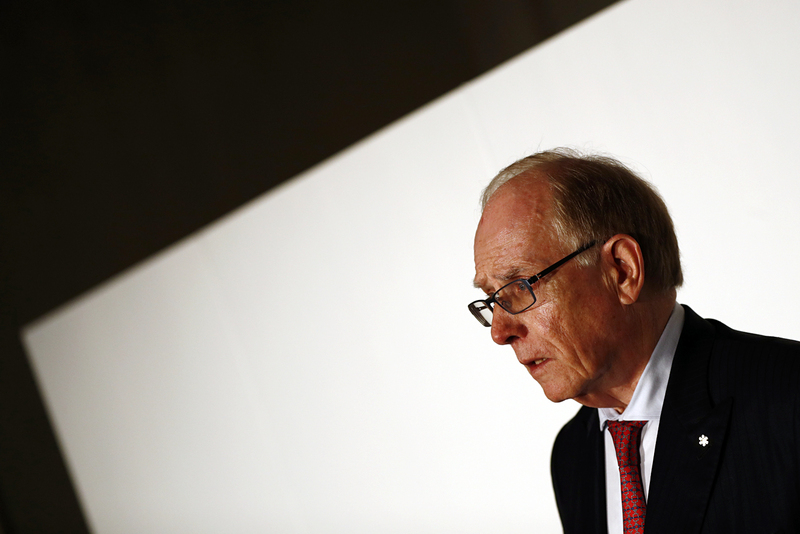 The publication of part two of the report by the independent WADA commission headed by Richard McLaren has been met with a predictable reaction from Russian officials, who maintain that the investigation was biased against them. The consequences of the new findings, which range from a minor scandal without serious implications to a ban on Russian athletes competing in the 2018 Winter Olympics, have yet to be determined. Part two of Richard McLaren's report for the World Anti-Doping Agency (WADA) into doping problems in Russian sport, which was released on Dec. 9, has clarified the conclusions reached in part one, which was made public in July. In the new report, McLaren once again stated that between 2011 and 2015, Russia ran a state-sponsored doping program for its athletes as well as an extensive cover-up operation. According to the McLaren report, the doping system involved Russia’s Sports Ministry, and the cover-up operation was carried out by the Federal Security Service (FSB). According to the WADA report, more than 1,000 Russian athletes participated in the doping system, including athletes who competed in the 2012 Summer Olympic Games in London and in the 2014 Winter Olympic Games in Sochi. "It is unrealistic to do what we are accused of"
Commenting on the report, Deputy Prime Minister Vitaly Mutko, the former Russian Minister of Sport, said that Russia could not have influenced the results of the Sochi Olympics. "The Games were conducted by international sporting organizations – everything was under control," Mutko said, adding that it was “unrealistic” to manipulate athletes’ urine samples. Mutko did not rule out that there may have been individual cases of doping use by Russian athletes, but categorically denied the existence of any state-sponsored doping program in Russia. "We do not need any 'dodgy' victories," Mutko told the TASS news agency. Vitaly Smirnov, the head of the independent public anti-doping commission set up following the publication of the first part of McLaren's report, also rejected the possibility of the existence of a doping program in Russia. Smirnov noted that the accusations were largely based on the testimony of Grigory Rodchenkov, the former head of the Moscow anti-doping laboratory. Rodchenkov has said that he organized the manipulation of doping samples. He has since moved to the United States. Smirnov said that, given the circumstance, Rodchenkov’s testimony cannot be trusted. The consequences of the doping charges remain unclear. After the publication of the first part of the report, there was a serious possibility that all Russian athletes would be banned from competing in the 2016 Summer Olympic Games in Rio de Janiero. In the end, however, the International Olympic Committee (IOC) left the decision as to whether individual athletes should participate in the Games up to the individual sports federations. Nearly 300 Russian athletes competed in 26 sports and the country came in fourth in the number of medals won. Russia may not get off so easily now. The country may lose medals won in the Sochi Games and could even be banned from the 2018 Winter Olympics in Pyeongchang, South Korea. Alexei Karpenko, an expert in sports law, told the newspaper Kommersant that Russia may lose the right to host international sporting events on its territory and see its national teams in some disciplines banned from competing in international events. Andrei Smolensky, the head of the Sports Medicine Research Institute under the Russian State University of Physical Culture, Sport and Tourism, took a different view. According to Smolensky, McLaren's rhetoric "has become relatively softer" compared with what it was in the summer: McLaren said that Russia recently "had done many positive things" to combat doping. "I don't think that the IOC will rule to strip Russia of competitions or ban it from the Olympics,” Smolensky told RBTH. “Some countries may decide to boycott competitions held on Russian territory. But that is politics, not sport." Russian sports lawyer Artem Patsev noted that whatever decision will be made regarding Russian sport on the international stage will be made by larger organizations. "McLaren himself is saying: I am an independent figure, I have just analyzed the documents and arrived at my own conclusions. He does not even come up with any recommendations for the IOC or the international sporting federations. He just hands over his findings to them," Patsev told RBTH. Patsev added that the IOC had a special commission that was investigating whether Russia was running a state-sponsored doping program. "Individual violations by individual athletes do not prove the existence of a doping system,” Patsev said. “It is the findings of the IOC commission that will determine whether Russia will be subjected to any international sanctions." According to the lawyer, it is the IOC commission rather than the McLaren report that will have the decisive say in the future of Russian sport in the international arena.